DEMCON is a high-end technology supplier of products and systems. It is a fast-growing company that supports clients with a wide range of competencies. DEMCON bunova, part of the DEMCON group, is an engineering agency that specializes in simulations with a focus on flow, thermal, acoustics, mechanical, and electromagnetics challenges. Upon request, we may also be of service outside this general list of disciplines. We aim to be a partner to customers, helping them achieve their goals in research, development, and engineering programs. Being part of DEMCON means it is also possible to meet the needs of clients entirely: from proof of principle, prototype, and preproduction to serial production. Simulations can play an essential part in the early stages of a product development process, or any other engineering problem. When creating a simulation, it is important to account for all of the significant physical phenomena while also making sure that the model is not overly complex. Thus, you need a good understanding of all of the physical effects, their approximations, as well as their numerical implications. Typically, engineers using finite element method (FEM) software only spend part of their time on simulations. As a result, modeling a complex system can be quite challenging and time consuming, and the results can be unreliable. At DEMCON bunova, we have years of experience dedicated to creating simulations and helping customers deal with their problems. Using this expertise, we are able to solve complex technical problems in a reliable and efficient way. 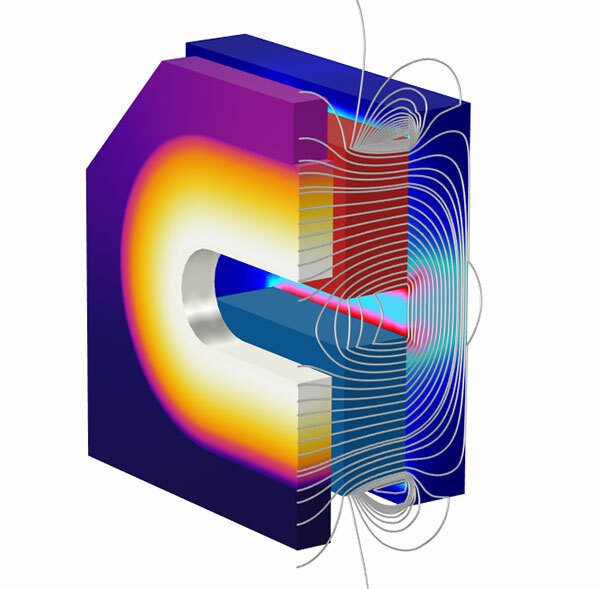 Currently, we use the COMSOL Multiphysics® software for electromagnetics, thermal, and complex multiphysics problems. For example, when modeling induction heating, radiative heat transfer must be accounted for. In addition, material properties are often temperature dependent, which makes induction heating a strongly coupled and nonlinear problem. 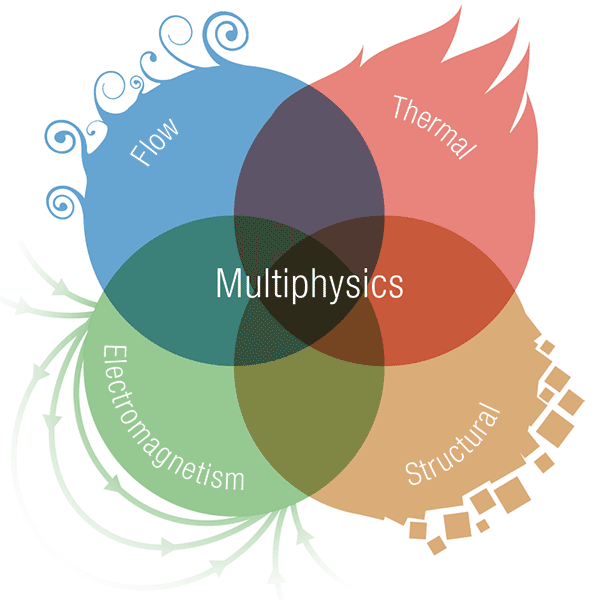 For such problems, COMSOL Multiphysics® is especially well suited. The same holds true when resistive heaters are used at high temperatures. Below is an image of a resistive heater used in a pulsed laser deposition (PLD) device. 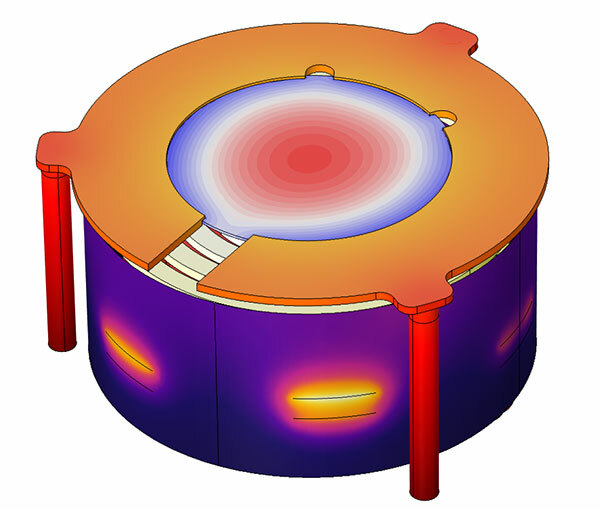 Simulation of a resistive heater for a PLD device. Simulation of a resistive heater for a PLD device. The thermal analysis of a coil is another example. In a coil, the many windings conduct heat efficiently in one direction. As for the other directions, the heat must diffuse via the potting. Combining the anisotropic effect with a temperature-dependent resistivity makes this a complex multiphysics problem. Below is an image of an actuator where this type of analysis is relevant. For many types of electrical machines, such analysis is important to determine limits on operating conditions. Thermal analysis of an actuator model. Thermal analysis of an actuator model.